I am linking up with Mosaic Monday and Our World Tuesday and NC Sue WordlessThey are all fun memes to participate in...I hope you can join in with the fun and check out some of the participating posts. We have been so many different places since our Florida trip, a lot of day trips. 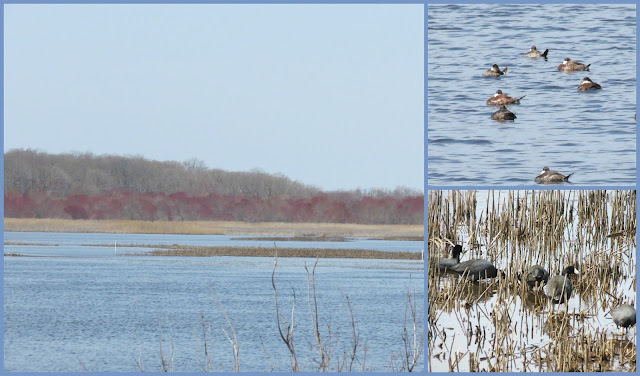 This post is on a day trip when I took my older brother for his first time to Bombay Hook National Wildlife Refuge in Delaware. Hubby stayed home and my brother (another amateur photographer like me) and I enjoyed checking out the birds and the wildlife. The Tree Swallows had returned and there were numerous swallows flying over our heads. My brother was enjoying taking shots of the swallows, he must have taken over a thousand photos during our visit to Bombay Hook NWR. 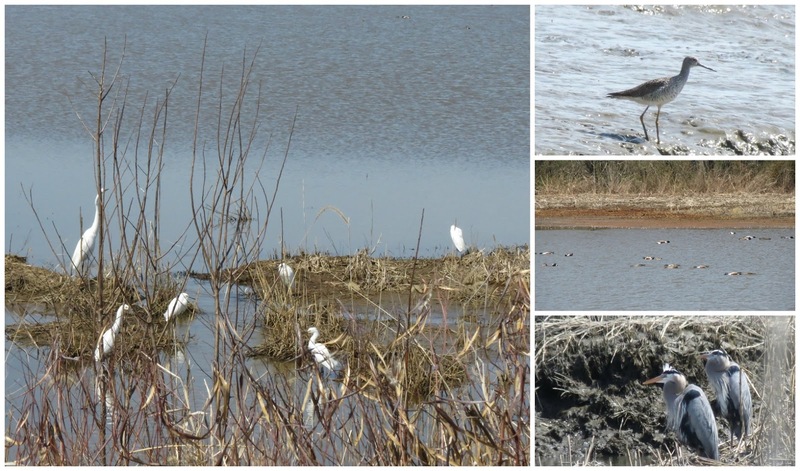 There were many Egrets, both Snowy and Great Egrets, Yellowlegs, Northern Shovelers and two Great Blue Herons. 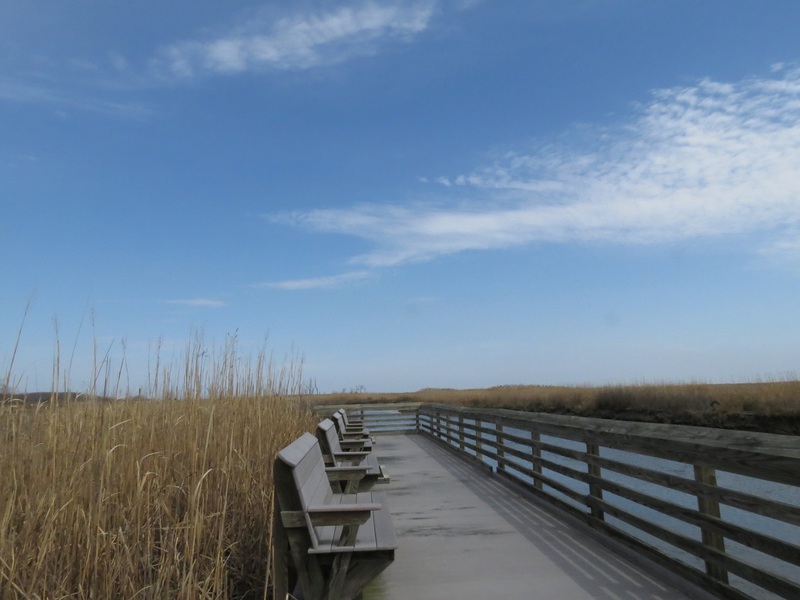 The shorebirds were returning to the Delaware shore and the wildlife refuge. I believe this is a large group of Dunlin but there could be other species mixed in this group. I think there are some Egrets mixed in the group above. This daytrip was late April so the trees were just starting to blush, some Ruddy Ducks and some American Coots. Above are a few Glossy Ibis, Egrets, a Screech Owl in her nest and an adult Bald Eagle with two juvenile eagles. I had fun showing my brother one of my favorite wildlife refuges. I can assume by how many photos he was taking he had fun too. Thank you for visiting and for all the nice comments.. Have a great day and week ahead! I use Pic Monkey to create my mosaics, you can use Pic Monkey free or pay for an upgraded version. I hope you can join in on our fun with Mosaic Monday and Our World Tuesday and NC Sue's Wordless. Thanks to Judith our host of Mosaic Monday and to the hosting group of Our World Tuesday: Arija, Gattina, Lady Fi, Sylvia, Sandy and Jennifer and to Sue for Wordless Wednesday on Tuesdays. What a wonderful place to go bird watching and I am sure your brother both enjoyed the birds and photographing them. SO many birds! WOW! Hello Eileen,Thank you so much for visiting me! I love all your pictures! The swallows very beautiful! The real thanks and bunch of seabirds simply a fabulous spectacle to admire! Have a good Sunday and week. what a sight to see with all those hundreds of birds in flight at one time. and nothing could be better than being with another photographer. it is hard when we go out with someone without a camera. we keep stopping and they keep waiting..
What a neat place- I would probably have had to bring along a couple of extra batteries for my camera! Have a great day today,too, Eileen! Enjoy! Lots of beautiful aspects presented and My fave is the the one with the large group of flying birds...Last week I captured a group, in flying, too...over the houses in the field! I'm making progress at photographing birds, isn't? All the best and a good start in week, too! That's a lot of birds, Eileen! P.S. I saw a Luna Moth last night. First time in about five or six years. What a great place for birdwatching !! Fotos lindas como sempre, gostei mais do primeiro mosaico. Boa semana com tudo de bom! you find the best nature spots!! awesome images, i hope you really enjoy this nice long weekend!!!! I would have taken a thousand pictures too, what a lot of birds to enjoy. Eileen, what a great trip you had! How I wish I were there too, so many types of birds to watch. 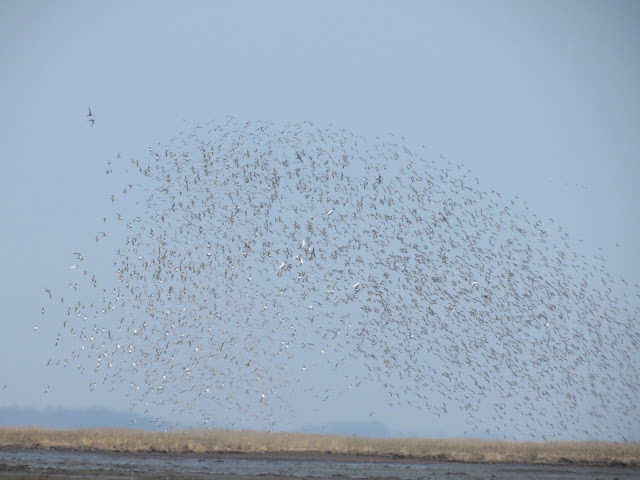 I can't believe that cloud of Dunlins! That would have been amazing to see. A good place for Shorebird habitat. And it's "warming up" perhaps still chilly along the waters. Perfect weather for birding! Beautiful collages, I like the swallows. That place looks awesome! Love the screech owl! Save the birds! How fun to see them have fun in the trees. Great photos, it's great to see my birds returning here too! 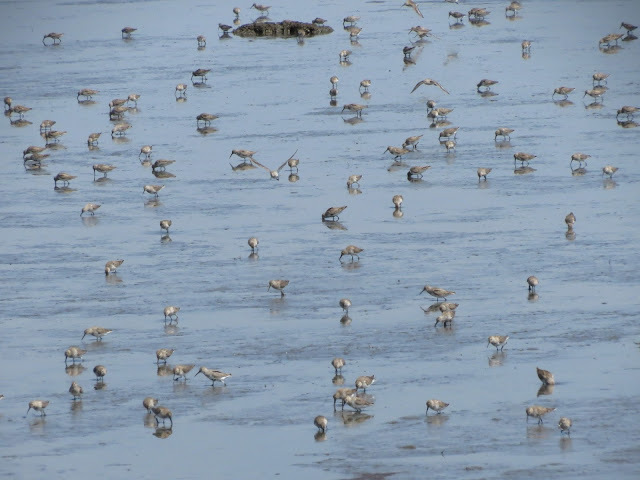 a mess of shorebirds! love the pretty tree swallows! we don't see them here. Beautiful Tree Swallows, Dunlin and the Glossy Ibis, are lovely. What a great day you had! A beautiful place with lots of birds. The swallows are adorable. Great post! !What a lovely place!Wonderful images!Such beautiful birds!! No shortage of photo ops there, for sure..Great shots..Love the Tree swallows..They used to dive bomb me when I was mowing..I guess I was stirring up bugs.. The swallows are really beautiful and the large group of dunlins looks amazing! Great collection and variety of photos. You had a super time together, and by the number of photos, so many to take home and sort through. The beauty of digital, and for me, #1 is the screech owl in his nesting box. You moziek posts are always very nice to see and I enjoy also always there :-) I see one of the mozieken an owl owls in a closet. Great to see this. also the black ibises are fantastic. Very nice new week Eileen,. I have been enjoying all your photos of the birds too! Nice to see so many varieties that we don't get here. Amazing flock of shorebirds flying caught in action. There is nothing you cannot admire from nature. Simply it's always filled with beauty as shown in your posts. I admire those who are able to get outside and take pictures. I used to but am somewhat disabled now and a trip outside for me is usually to see a doctor. That large flock of shorebirds is amazing. 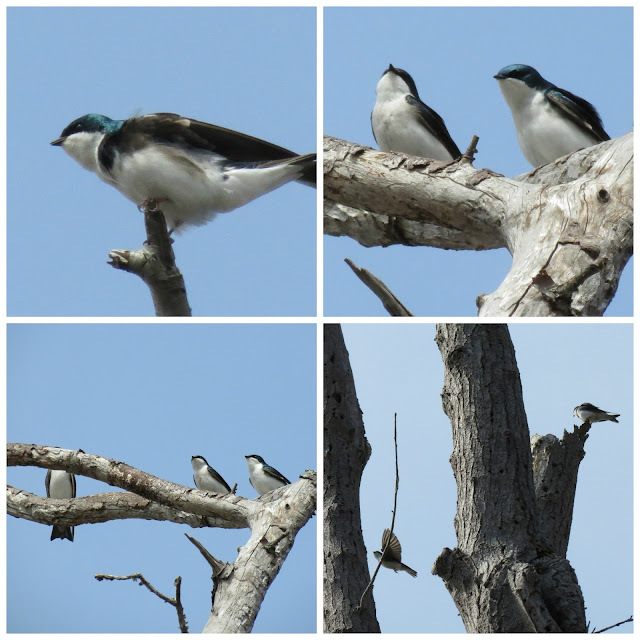 Pretty little Tree Swallows. Thanks for taking us on this wonderful bird watching trip, Eileen. I particularly enjoyed the photo of the school of birds. I have heard that they decide which direction to go by voting, millions of times in a minute or so (or perhaps even less) - pretty amazing and it gives me goosebumps to think of such refined communication. Wow! What a great place to birdwatch! Hi Eileen, wonderful shots and your mosaics are always interesting. I had to have a second look to see that owl peeping out of the hole. What wonderful photos. A beautiful place to visit. Another successful birdwatching day! Love your photo of all the birds taking flight. Hi Eileen! I love the photos of the swallows, and the returning flocks, are really amazing to see! Like seeing the "bunches" of birds . . .
Great pictures and collages. Very nice the landscape with the group of Dunlin! A marvellous array of birds. I like the Glossy Ibis. You sure are packing a lot into your retirement. 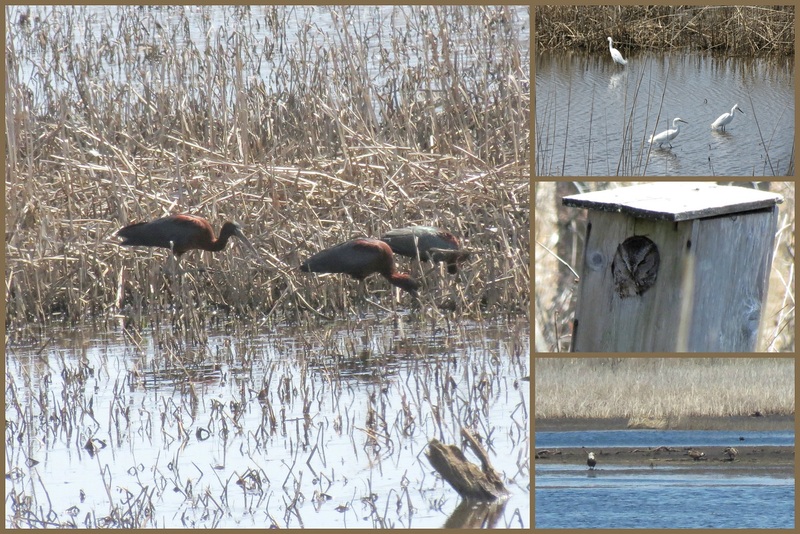 You live in such a great area for seeing migrating birds! Always good photos--love that owl peeking out. It sounds like you and your brother had a nice outing together. Stunning images as always and such a variety of wild birds to admire. It can tell it was a great day out for you to share with your brother. fabulous photos of all these birds in the sunshine. Great ! Beautiful shots of the birds. So many birds all in one place. You saw some amazing sights at Bombay Hook and how lovely that you had your brother's company. Great photos as always Eileen and happy day to you. So many different birds Eileen!! You almost need a swivel seat that turns around to get them all!! Egrets are always my favorite, but the swallow are pretty! What a great series of photos, Eileen! And what a lovely way for you to catch up and spend quality time with your brother. I especially loved the waders in flight, the Owl peeking out of its nestbox and the Glossy Ibis. Did you know we have the same ibis in Australia? Weird that you and I can go birdwatching on opposite sides of the world and see the same bird (one of my favourites!). Such a wonderful variety of birds! I can just imagine the fun you and your brother had while clicking away. That is the most amazing place for birds and I am sure it was a lot of fun seeing it through new eyes! And your brother was so lucky to have such a great guide. We see those swoops of dunlins on the Oregon lake, but never close enough to capture, at least with my camera. It is amazing how they move as if they were one body! beautiful shots! what a great place to wander with your brother! Boa tarde, perfeitas captações das lindas aves marinhas, a sequência é excelente. This is a fabulous wildlife refuge and since I enjoyed being shown around, can only imagine how excited your brother must have been to be there in person with his camera. Thanks for linking to Mosaic Monday Eileen. So many wonderful birds, have enjoyed your post. What a lovely series! A great place to take your brother, I bet he enjoyed it. My word - such a dense flock of birds - must be hundreds of them! Peaceful bird sanctuary....great photo ops! Good for you! No wonder your brother took so many photos. What a variety of birdlife. I'm just now getting around to visit after about three weeks. Starting to feel like me. I really want to go here someday. I think of it every time we are on the East coast but we never make it. Saw some swallows this week but never got a shot. They are quick. A rest on that boardwalk would be lovely! Hope you have had a wonderful holiday weekend! Your shots are amazing! I also noticed your previous Saturday's Critters post, so I'll keep it mind when I have animal shots. Thanks for your visit and Blessings! Terrific captures as always, Eileen! So many beautiful birds! I'm sure your brother enjoyed it! A great trip!! My, you really get around! Looks like a wonderful place, and the variety and quality of your photos does it justice. What a fantastic place to visit with so many birds all in one place. The photo with the flock of birds flying above really lets one see how many birds are close by. All magnificent wildlife shots ~ Love the boardwalk also! Eileen, I love that boardwalk shot! What a beautiful place to sit and observe all the amazing wildlife. I could spend hours there. Loved all your photos! That's a gorgeous place! Tree Swallows are one of my favorites! What a great place to go birdwatching - that boardwalk looks awesome and the birds are so pretty. I love these birds and wow that is a large group of birds. You were in a birding paradise! I love the sky scene - full of wings! What a faboulos pictures you are showing and what a light of the skies. What a wonderful bird adventure. You do an amazing job on your photos. So many birds! And all very lovely! Looks like a fantastic place to visit! Glorious pictures of this amazing place! Lovely! Nice to see more tree swallows. Thank you also for your visit and sweet comments. Hope you enjoyed your weekend. Have a wonderful week! Love all those wading birds Eileen, and especially that huge Dunlin flock. Fantastic. wow, so many shorebirds. I did see eight :) It is a truly beautiful sight. Wonderful photos! What a great place to visit! I love your boardwalk Eileen, what a lovely place to capture all that beauty. Love your shots! The boardwalk photo looks like you could walk right into it! I visited Bombay Hook once only but I enjoyed it immensely. Great spot for birding with a wide variety of species. Your love of nature really comes across in your shots. Your little mosaics are lovely - I'm not a birder myself but I especially like the third image with the marsh and the birds.